When it comes to furnishing your patio or garden the options can be overwhelming. What kind of furniture is going to be able to express your unparalleled sense style, last reliably through your family’s biggest summer moments, and keep your bank account afloat? Has it even been created? It has a beautiful, natural look. What fits in better with the great outdoors than wood? Wooden furniture will effortlessly blend in with its natural surroundings, while still serving as one of the focal points of your backyard. Draw the eye of your guests to the warmth of the different shades and intricacies of the different patterns of each piece. These qualities make wooden furniture so unique that even if you’re buying a set, each piece will be its own! Wood is produced with help from the elements, it was literally made to withstand them! Once a type of wood is properly chosen and treated, it won’t rot or become infested with bugs, and it won’t rust like metal. Wooden furniture is easy to maintain. This is especially true with Polywood furniture, which is made from a synthetic type of lumber. It’s resistant to any sort of corrosive substances, moisture or weather! Stains are easily treated with standard cleaning products. You can even leave it outside year-round without having to worry about damage from extreme weather. When the grass starts to peek out and you hear the birds chirping, just give your furniture a quick wipe-down and you’re good to go! Tired of your beige outdoor color scheme? Stain your wood darker! Do you want to ditch the natural vibe and go for something more modern? Paint it red (or whatever color is in this season)! Wooden furniture gives you the flexibility you want without having to buy a whole new set of patio furniture every spring. This makes it a long-lasting, quality investment. Plus, because of that durability thing we talked about, you don’t have to worry about finding a place to store it in the offseason. And would you believe me if I told you it’s also eco-friendly? It’s true! Making wooden furniture doesn’t have the same harmful side-effects on the environment as other materials, like plastic; and while Polywood furniture is made with elements of plastic, all of those materials come from recycled consumer plastic waste, so the environmental effects are just as positive. If you want a beautiful, dependable, affordable option to furnish your patio, wooden furniture is the best fit for you. You’ll want to invest in pieces of good quality at a great price. 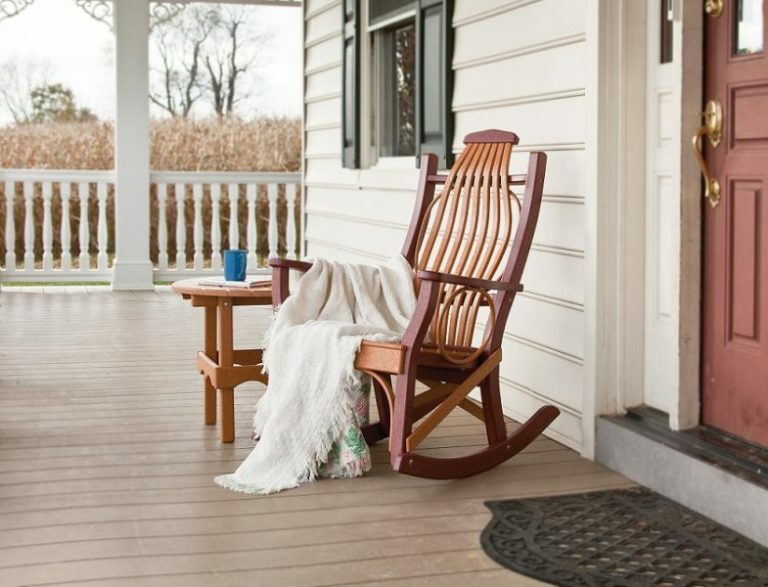 Let Carriage House Furnishings take care of that for you with our outdoor Amish made furniture of unrivaled craftmanship and charm!